Our caregivers can be incredibly patient and compassionate that can change our client's lives. Here are some of our caregiver's success stories. One of our Homebridge clients, Kathleen, was going through tough times, and then when her main Caregiver went on vacation Kathleen had a difficult time trusting new Caregivers coming to help her. Luckily, Caregivers Altesha and Anne were able to help her out with both patience and compassion. Altesha patiently listened to Kathleen and realized that she was stressed about her family and health. Altesha made a connection with Kathleen, she listened to her concerns and shared her own experiences with her. They both ended up learning a lot about each other and building trust, “she reminded me of my grandma,” said Altesha. Anne used a lot of patience to make an impact, especially when Kathleen did not want to open the door. At one point, Anne waited outside for two hours, and along with Care Supervisor Hector’s help, Kathleen finally decided to let her in. Some days the door would be blocked, but Anne kept her cool, stayed positive and polite, and after many days of perseverance and patience, Kathleen finally gave her a key. Thank you, Altesha and Anne! Your work and compassion is inspirational! Peggy is one example of Homebridge Caregivers who do amazing things and shine even in the most challenging circumstances. Peggy is a very attentive person and has been Richard’s caregiver for over two years. Their dynamic is very wholesome; Peggy is constantly making sure that Richard is taken care of at all times. She helps him with daily tasks such as cleaning his room and gets along with Salami (Richard’s dog). Peggy has a strong maternal spirit and is constantly making sure that Richard and his environment are safe and sound. At times, Richard may disagree with her and they may not see eye-to-eye all the time, but he knows she really cares and has his back. “Peggy is above and beyond, she is a real trooper,” said Richard. In one particular incident, Richard’s wallet got stolen with his rent money in it, which made him in danger of getting evicted. Peggy came to the rescue and was able to find him a free lawyer that took his case. 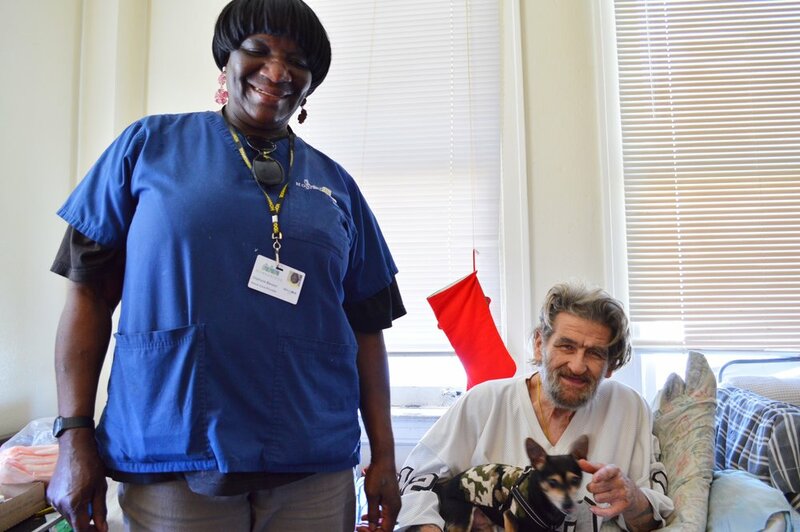 Peggy, along with her Small Care team and the resources that she found, were able to help Richard stay in his home with donations to pay a few months of rent in advance. This very stressful and negative situation was able to be turned around with amazing results due to Peggy’s actions and incredible determination. Jesse is a very caring and thoughtful Caregiver that has been working with Homebridge for only six months. “He’s a natural Caregiver and is concerned about everybody,” says Homebridge client, Susie. Jesse and Susie have a very strong relationship and practice great communication. They have come up with a plan to be more productive: they talk about Susie’s projects and goals while she takes notes. Then, as they accomplish things, they cross them off the list to help stay on track. They have even coordinated in preparing Lollipup for a dog show. “We work well together because I have trouble talking at times and he knows what I need and is very attentive.” Says Susie. “I wouldn’t know what to do without Norien,” says Homebridge client Jeffrey. Norien, who has been working with Jeffrey for three years, excels at meeting clients where they are and working to create a lasting bond that benefits the long-term health of clients. Many of Norien’s clients have critical behavioral and cognitive challenges, and Norien provides a very calm and attentive approach which has led to many of her clients asking for her to be their Caregiver. Norien, who worked at a nursing home in the Philippines before moving to the U.S., has worked as a Caregiver with Homebridge for over 15 years. Her career of taking care of clients with understanding and compassion inspired her two daughters, now ages 24 and 27, to both become registered nurses. We asked Norien how she handles clients during her most difficult days. Norien says she stays open minded, stays patient, gives clients choices and boundaries, and doesn’t give up. Thank you Norien, your work is inspirational! Because of failing health, Larry lost one of his legs, became reclusive, and stopped regularly eating. He would fall out of bed and since he was unable to get off the floor by himself, he had to call 911 every day. Luckily, our Caregiver Daphyne did not give up on him. Daphyne cares deeply about Larry, she makes him food and buys his favorite candy (which makes Larry very happy). Thank you Daphyne for being such a great Caregiver! Your work is truly amazing.